KWin allows the end-user to define rules to alter an application's window attributes. For example, when an application is started, it can be forced to always run on Virtual Desktop 2. Or a defect in an application can be worked-around to force the window above others. Step-by-step examples are provided along with detailed information on using the KWin Rule Editor to specify Window Matching and Window Attributes. To see what's possible, detailed examples are provided which can also be used to model your own rules. A special page is to dedicated to address Application Workaround. When an application starts (or the rules are modified), KWin evaluates the rules from the top of the list to the bottom. For all rules which match a window, the collective set of attributes are applied to the window, then the window is displayed. Should two or more matching rules enable the same attribute, the setting in the first rule in the list is used. You can tailor children windows for the application by placing the more restrictive rules first - see the Kopete and Kopete Chat Window example. As the name implies, Window matching is used to specify criteria to match one or more windows. The other three tabs are used to alter the attributes of the matching windows. Panels can also be affected. Each window rule has user specified Window Matching criteria. KWin uses the criteria to determine whether the rule is applicable for an application. Along with Window Matching criteria, each window rule has a set of Window Attributes. 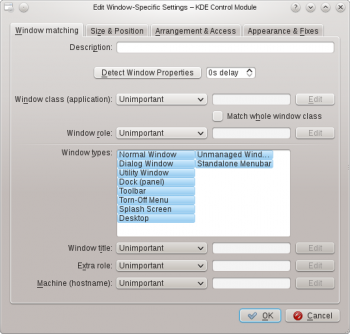 The attributes override the corresponding application's settings and are applied before the window is displayed by KWin. This page was last modified on 25 March 2012, at 09:23. Content is available under Creative Commons License SA 4.0 unless otherwise noted.